Skopelos Press Business Nomad: Children or Raccoons - Economy II Gone Mad? Children or Raccoons - Economy II Gone Mad? Our neighbourhood is infested with destructive, aggressive raccoons. Raccoons are neither cute nor lovable. They're nasty, aggressive & dangerous. Raccoon poop contains parasites deadly to children. Parents are afraid to let their children play in backyards, for fear they'll be exposed. Raccoons destroy property & impose costly repair bills - which fall disproportionately on people who can least afford them. As in many cities across North America, Toronto's raccoon population is expanding and becoming more aggressive. Other jurisdictions (e.g. 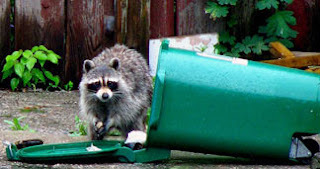 California, Germany) have taken firm measures to reduce the risk posed by urban raccoons. But in Toronto, if you harm a raccoon you'll be charged and could be imprisoned. Even if you're a poor man driven to distraction by the damage they wreak. Who is the City of Toronto's customer? Clearly, it's not Toronto citizens & their children. In fact, the City will go to great lengths to ensure the safety & comfort of raccoons - at the expense of citizens & their children. We need to help Economy II - (public services, health care, education, NGO's...) - improve customer service (i.e. Safety, Quality, Service), while reducing Cost. The first step in this essential journey is asking, "Who is my customer?" and "What do they need?" Toronto's raccoon fiasco suggests the City isn't interested. How do we get their - or any public mandarin's attention?